When it came time for the Dolphins organization to recognize the duo of wide receivers that electrified the Orange Bowl throughout the 1980s, it was only fitting that Mark Duper and Mark Clayton enter the Ring of Honor together. For the first time in team history, a dual induction saw the pair immortalized on either side of our Hall of Fame quarterback in the stadium’s East endzone. And as the “Marks Brothers” were linked because of their many similarities, so are our dishonorees this evening. It’s quite rare for two players’ negative impact on the team to be linked, but such was the case in Miami in the late ‘80s. In the 1987 and 1988 drafts, the Dolphins used their first round picks on a pair of defensive ends that were to strengthen a lackluster defense, and provide balance for an explosive offense. Coaches expected the two players to immediately step in and compete for starting jobs. Instead, both would go down in history as some of Miami’s biggest draft busts. 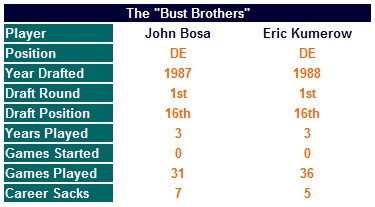 For their mirrored inadequacies, TDMMC recognizes the “Bust Brothers,” John Bosa and Eric Kumerow, in our Ring of Dishonor. When selecting a worthy candidate for the Ring of Dishonor, career data is usually used to support the choice. However, in the case of Bosa and Kumerow, it is their noticeable lack of any statistics that warrants their selection. Had either player been selected outside of the first round, they would’ve faded into obscurity and been long forgotten. However, when you have consecutive first round picks at the same position, with no considerable stats on their play, it speaks volumes. While the chart above illustrates some staggering similarities, it's the intangibles that really connect the two players. Both were considered draft reaches. Bosa was projected to go in the early second round, while Kumerow was expected to fall to the middle rounds. Both players were "tweeners" -- too small for the defensive line, yet too big and slow to play linebacker. Both were seen as finesse players, taken for potential, despite concerns that their abilities might not match an NFL system. Even their exits were alike, as both were out of football within three years of their acquisition, after suffering knee injuries. In six combined years, neither started an NFL game. But finally, and most importantly, both were drafted by Don Shula at a time when the Miami defense was in desperate need of impact players. In hindsight, it's easy to see just how crippling these two selections proved for Miami. With Marino at the helm, the Dolphin offense was dominating opposing defenses, but as good as it was, it couldn't compensate for the dismal play on the other side of the ball. A glaring example of this came in a 1986 game against the rivaled New York Jets. Marino bolstered the team with 450 yards through the air and 6 touchdowns... ...only to lose 51-45 in overtime. Miami needed a couple of sure things to help turn around a dismal defense, but what they got was a duo of duds. It's important to note that Bosa and Kumerow's tenure came at time when the league had no salary cap or free agency. Teams were built primarily through the draft, and poor decisions often had long term impact. Taken back-to-back, the pair crippled the Miami defense for a decade, as the team was eventually forced to draft for other areas of need. For their comparable lack of contribution, we are pleased to recognize both John Bosa and Eric Kumerow as the first dual-induction into the Ring of Dishonor.